Telefónica stands at a “unique” and “extraordinary” juncture, characterised by disruption, and needs to continue its successful transformation from a voice-based phone company to a digital technology company to prosper in the new age, according to executive chairman José María Álvarez-Pallete. “Today, the biggest distributor of content in the world does not generate a single piece of content,” Álvarez-Pallete told investors at the Spanish telco’s general shareholders meeting. He said that the biggest enabler of personal transport did not possess a single vehicle and the biggest holiday accommodation company did not possess a single property. In 2000, he said, four of the five top companies in the world were industrial companies. Today, the biggest five companies in the world are Apple, Amazon, Microsoft, Google and Facebook, he said. Álvarez-Pallete said that Telefónica was nevertheless in a fortunate position in that the changes taking place put a premium on data communication. he said that Telefónica had to create new networks to deliver high-capacity communication to deal with the exponential growth in data. said that revenues from high-speed broadband and digital services had passed the 50% mark for the first time last year, amounting to 52%. 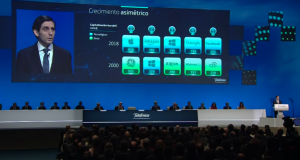 Álvarez-Pallete said that Telefonica’s investment in its network had been costly and had required the company to take on additional debt, but that Telefonica today was nevertheless “incomparably stronger” than five years ago. The company today has 350 million customers in 17 countries around the world, and was a leader in fibre in Spain and Latin America. Álvarez-Pallete said that Telefónica needed to further transform itself to capture opportunities from the wave of new digital services that require connectivity, by building a digital technology distribution platform, investing in new networks and by transforming its culture to enable it to work in a more agile way, and remain in the vanguard of the digital revolution with a virtualised, automated network and the ability to deliver personalised services.